Since it is Valentine's Day, I have decided to do a special giveaway in conjunction with the Valentine's Day Love: Nuts About You video. So I have decided to give away two special Nuts About You party kits that contain all that you need (excluding the nuts) to create your own little station. Win a Nuts About You party kit! 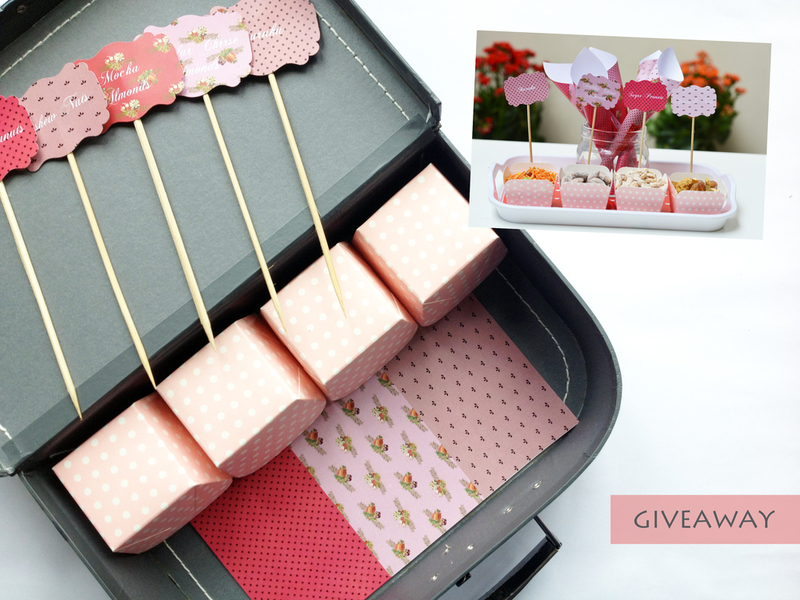 Each party kit contains 4 pink polka dotted boxes, 4 signs, 12 paper cones. 2. Share the facebook video on your facebook profile page. b. Click on the button that says Share. c. Ensure that the sharing settings (next to the button that says share video) are set to Public. d. Write a valentine's day message to your friends to share the love. The person who gains the most likes and shares at their post & I will draw another winner at random. Head to the facebook page to join in the fun! I hope you win. * This giveaway is only open to Singapore residents and will end on Friday 15 February 2013 at 12 midnight (singapore time) and the winner will be announced on Monday 18 February 2013. The winner will need to email their contact details to me by Wednesday 20 February otherwise we will draw a new winner.